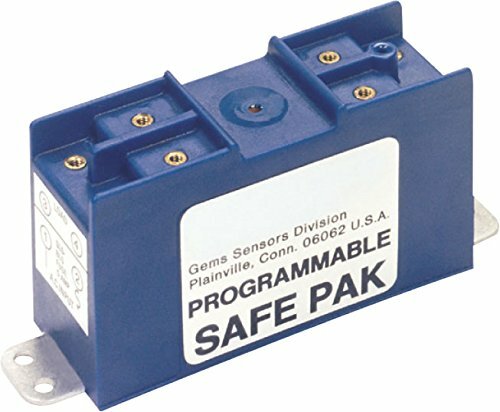 Gems programmable Safe-Pak relay. Operations such as normally open, normally closed or latching are programmed into these versatile SAFE-PAK units by the user during installation. Selection is made by simply connecting sensor wiring (and jumper wire when required) to the proper terminals on the unit. 0.5A at 20 V to 0.05A at 200 V AC/DC Load current maximum. 0-250 VAC load voltage range. Operating voltage: 95 to 125 VAC. Less-than 30 K turn-on sensitivity (typical). 60 K Turn-off sensitivity (typical). Operating temperature range: 32 to 140 degree F. Approvals: UL, FM, CSA. 6" height.